Taking a breather from my soup and bread rampage earlier in the week, I decided to conjur up some Sunday brunch with the trusty ol' waffle maker. I took one look at the dusty device and suddenly realized I wasn't feeling Belgian this morning -- I was feeling French. I remembered a delicious breakfast that my sister, mom and I shared in Dublin at Lemon Crepe & Coffee Co. about a month ago. Let me rephrase that: our "breakfast" was more like dessert. If you ever have a chance to visit Dublin, put this place on your list -- the crepes they make are divine and the size of the menu is overwhelming. 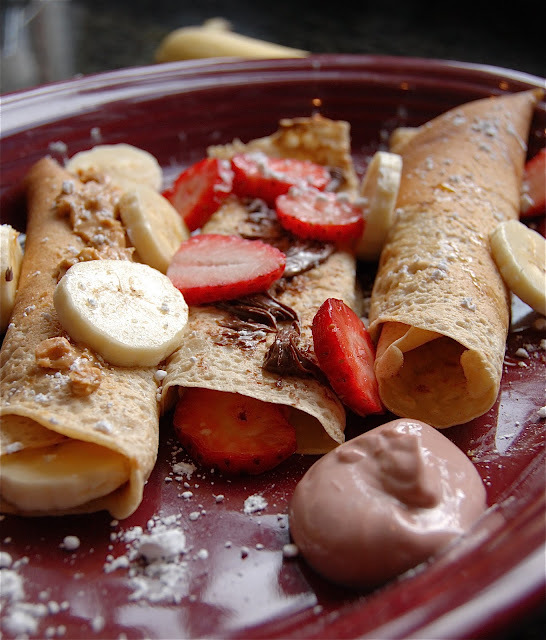 Sweet crepes, savory crepes, chocolate filled, meat filled, topped with fruit, drizzled with honey --you name it, they have it; you want it, they'll make it. We stuck with some simple pairings, ordering one filled with nutella and banana and another oozing with melted dark chocolate topped with strawberries. Sinfully sweet. Of course we had to try a savory one as well...the egg, cheese and mushroom filling did not disappoint and was the perfect foil to our sugary indulgences. It was with this meal in mind that I embarked into uncharted territory to attempt the crepe. Having never made one before, I did some preliminary research on the technique, knowing that the delicate French version of the pancake required much more dexterity to make than its American sister. I found that the ingredients were fairly simple and that once I was able to master the "skillet twirl" I was able to achieve the thin, flat shape of a perfect crepe. According to CookingLight, it is best to combine all of the ingredients in a blender and then cover the batter and let it rest, chilled, for 1 hour. This allows the proteins and damaged starch to absorb the liquid, ensuring that the crepes will be soft. This method also allows the air incorporated into the batter to dissipate, so the crepes will be paper-thin. After the crepe batter rests, stir it with a whisk to make sure the flour is evenly dispersed, and stir occasionally throughout the cooking process for the same reason. (The batter should be the consistency of heavy whipping cream -- fluid enough to produce a thin, even crepe, but with enough structure to hold together). A non-stick or cast iron skillet is recommended. I went with an 8-in cast iron sprayed with cooking spray to prevent sticking. When making a crepe the goal is to distribute a thin layer of batter quickly over the base of the skillet so that it will have uniform thickness and cook evenly. I followed the instructions to take a scant 1/4 cup of crepe batter and add it at once to the center of the pan. From there I began to rotate the skillet in a circular motion to allow the batter to run to (but not up) the sides of the pan. Not every attempt was a perfect circle, but by the end I was pretty confident with the technique. Since crepes are so thin, they don't need very long to cook. Cook the crepe on for about a minute, until the edges begin to curl. Take a rubber spatula and lift the crepe. If the edges of the crepe appear to be crisp, the underside is brown, and it shakes loose from the pan, it's time to turn. It will need to cook only briefly―about 30 seconds or less―on the other side, just long enough to set the center of the crepe. I found that the time varied depending on the size of the crepe and the heat of the cast iron. As an amateur, I was pretty successful in the crepe-making experiment. The recipe I used yielded about 13 crepes. I stacked them on a plate, covered it with foil, and kept them warm in the oven at 200 degrees until it was time to eat. As for the fillings and toppings, we went sweet this morning -- Nutella, peanut butter, chocolate yogurt, maple syrup, powdered sugar, blueberries, strawberries, banana and apple were among the fixings. Next time I think I will fill the crepes while still in the skillet to allow the fillings to warm and melt into the shell itself, but having them separate this time around gave my family the freedom to fill as they fancied. The were quite delicious and not nearly as difficult to make as I had anticipated.